This enchanting temple is located west of Connaught Place and was build by Raja Baldev Das in 1938. 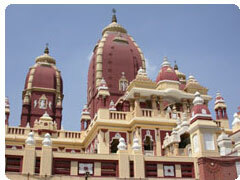 The temple is dedicated to the goddess of prosperity and good fortune & is commonly known as the Birla Mandir. It is modern in concept and construction and attracts several devotees and international tourists. The presiding deity here is Lakshmi Narayan, a manifestation of Lord Vishnu. The walls of the temple are decorated with various Hindu symbols and quotes from the Gita and the Upanishads. This temple was built over a six-year period (1933 - 1939) and was inaurgated by Mahatma Gandhi on the condition that people of all castes especially untouchables would be allowed in. It was built in the 20th century by the Birla family of industrialists known for its many other temples in India. Built in Orissan style, the highest tower in the temple reaches a height of 165ft, while the ancillary towers reach 116ft. The Geeta Bhavan, a hall adorned with beautiful paintings depicting scenes from Indian mythology. There is also a temple dedicated to Buddha in this complex with fresco paintings describing his life and work. The entire complex, especially the walls and the upper gallery are full of paintings carried out by artists from Jaipur in Rajasthan. The rear of the temple has been developed as an artificial mountainous landscape with fountains and waterfalls. The festival of Janmashtami is celebrated here with much goodwill and cheer. The exterior is faced with the white marble and red sandstone typical of Delhi's Mughal architecture. The interior court is overlooked by two-storey verandahs on three sides; there are gardens and fountains at the rear. For many foreign tourists, this is the place in India where they are confronted with the incongrogous sight of multiple 'swastikas'. The original meaning of the sign, an ancient Aryan symbol of the striving for perfection, as explained on one wall. Durga and Shiva are the other major deities housed in this temple. 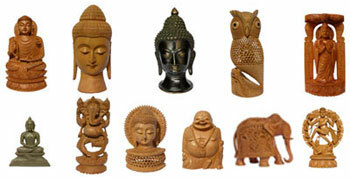 Mention must be made of the Buddha temple in this complex. Photography / Videogrpahy: Both Still camera and movie camera are not allowed.